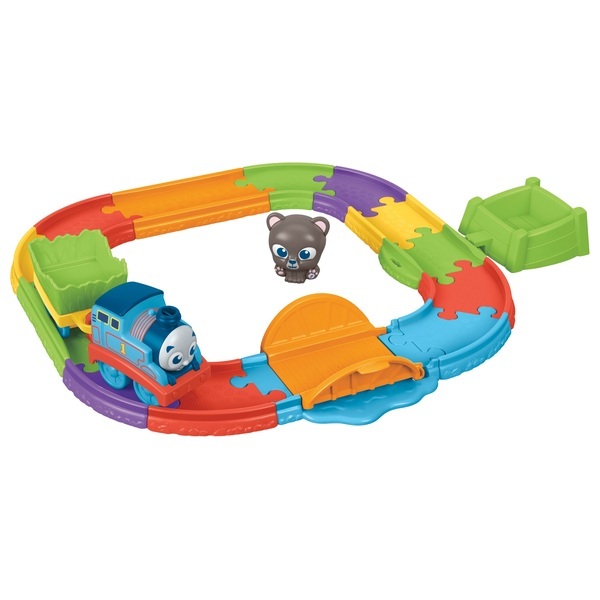 My First Thomas & Friends toy train set includes track layout, push-along Thomas, cargo car and bear figure! Bear can ride in Thomas' cargo car! Children can manually raise and lower the drawbridge! Thomas and cargo car can roll on and off the tracks! Play encourages fine motor skills (reaching and grasping), imagination and emotional connections! All aboard for an animal adventure with Thomas and his cute bear buddy! Toddlers will love pushing Thomas around this toy train set as they imagine endless journeys for the No. 1 blue engine and his animal friend. The bear figure can ride in Thomas' cargo car as children push him along the tracks and raise and lower the drawbridge. For even more ways to play, Thomas and his cargo car can roll on and off the tracks. The world of Thomas & Friends comes to life at the tips of toddlers' fingers as they create adorable adventures for their favourite steam engine and his bear cub companion.